The Basilica-Cathedral of St. John the Baptist in St. John's is the metropolitan cathedral of the Roman Catholic archbishop of St. John's and the mother church and symbol of Roman Catholics in Newfoundland and Labrador. The structure is a testament to the faith and determination of the Irish-Catholic population of St. John's, and of the neighbouring outport communities, particularly Harbour Grace, Ferryland, Calvert, Placentia, and St. Mary's who aided in its construction. The Basilica Cathedral of St. John the Baptist is a very early North American example of the Lombard Romanesque Revival style. The project began under the leadership of Bishop Michael Anthony Fleming, who went through great pains to secure a grant of land to build the cathedral. After making five trips to England, and following a Board of Ordnance grant, Fleming acquired nine acres of land on which to build the church and related buildings. Work commenced with the fencing of the land in 1838, and on the May 21, 1841 the cornerstone was laid. Sixteen years elapsed from the time excavation work began in 1839 until the cathedral was consecrated in 1855. Fleming consulted Irish architects John Jones, J.M. Butler, William Deane and German architect C. Schmidt concerning the plans for the building. Information based on documents found in Rome indicate that Fleming finally based his cathedral on plans prepared by the architect of the Danish Government, a Mr. C. Schmidt at Altona on the Elbe, just outside Hamburg. Fleming chose the Latin Cross as a shape and the Lombard Romanesque style as a nod towards Rome, which helped out by paying some of the bills for building the cathedral. This use of the Romanesque style makes the Basilica one of the earliest examples of the revival of Romanesque architecture in North America. Local quarries on Signal Hill and on Kelly's Island in Conception Bay, along with quarries at Mundy Pond, Long Pond, and the South Side Hills, provided stone for the structure, which was hewn by hand by Irish workers, and incredibly, by Fleming, who himself cut stone at Kelly's Island and loaded it into boats up to his waist in water. Galway limestone and Dublin Granite were also used to construct the building. The local Catholic and Protestant population in St. John's provided the labour for the massive construction job, the largest ever undertaken in Newfoundland and Labrador history to that date. The local population also raised substantial funds to defray the cost of building the church. 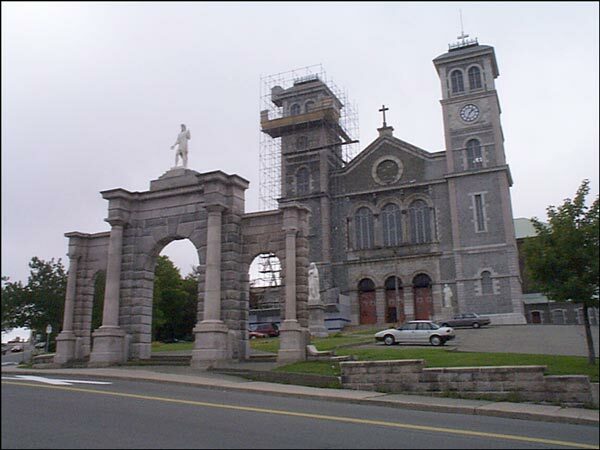 In 1846, the Great Fire in St. John's diverted the efforts of the builders and delayed the construction of the cathedral. Construction might have been hampered by the failure of Wright's Bank in London, where Fleming kept a European account for construction funds, but his congregation's zeal for completing the project meant that the bank failure was a minor setback. Fleming held the first mass in the unfinished structure on January 6, 1850. Later the same year on July 14, he died while at Belvedere Monastery, and he was buried in the cathedral's crypt, a distinction he shares with Bishops Thomas Scallan, J.T. Mullock, Thomas Joseph Power, and Archbishop Edward Patrick Roche. Another five years elapsed before the cathedral was completed under the direction of Fleming's coadjutor and successor, the Right Rev. Bishop John Thomas Mullock. When finished in 1855, it was 246 feet, 6 inches long, and 186 feet, 6 inches wide in the transept. The interior is 55 ft. high. At the time of its completion it had a seating capacity of 2,000 and was one of the largest buildings in British North America. The two 138 foot high towers on either side of the entrance contain a town clock and nine Irish bells. Irishman James Murphy cast the largest bell, the two-ton St. John Bell, in 1850. James Murphy won a Gold Medal at the Dublin Exhibition of Irish Manufacturers for his work. Bishop Mullock held the consecration mass on September 9, 1855. Many prominent Catholic church leaders attended the Mass: Most Rev. John Hughes, Archbishop of New York; Right Rev. Armand-François de Charbonnel, Bishop of Toronto; Right Rev. Thomas Louis Connolly, Bishop of New Brunswick; and Right Rev. Colin Francis MacKinnon, Bishop of Archat (Antigonish), Nova Scotia. The interior of the church contains many priceless artifacts and works of art. The stained glass windows came from Beauvais, France, from London, England, and from Dublin. There is also an extensive collection of Irish and Italian neoclassical and naturalistic religious sculpture. One of the most priceless statues, the "Dead Christ" by Irish artist John Hogan, is one of only three in the world and the only one in North America. There are also statues by renowned artist Fillipio Ghersi and John Edward Carew who was renowned in his day for his bas-relief "The Death of Nelson" on Nelson's Column in Trafalgar Square. Carew executed the statue of St. John the Baptist on top of the archway leading into the Piazza in front of the Basilica, as well as the Immaculate Conception in the centre of Cathedral Square, and St. Francis of Assisi on the east side of the entrance and St. Patrick on the west side of the entrance. There have been several additions made to the interior of the building in the twentieth century. The Newfoundland artist Dan Carroll, along with Archbishop Howley and the Conway family of plasterers designed and crafted the ornate ceiling in 1903 and the Rambusch Decorating Company of New York polychromed it in 1955. In its centenary year, 1955, the Cathedral of St. John the Baptist was designated a Minor Basilica by Pope Pius XII in recognition of its exceptional artistic, architectural and historical importance. In 1955 a massive pipe organ from the world-renowned Casavant Frères firm in Québec was installed as a memorial to the parishioners who died in World War I and World War II. The 66 stop organ with 4,050 pipes is the largest instrument in Newfoundland and Labrador. The government and people of Portugal contributed to the Basilica in 1955 when they donated a statue of Our Lady of Fatima, located under the west gallery. Pope John Paul II visited the Basilica on 12 September 1984, and each Christmas season the church plays host to a performance of Handel's Messiah by the Newfoundland Symphony Orchestra. In 1984 the Basilica was designated a National Historic Site by the Historic Sites and Monuments Board of Canada, and in October 1988 the Heritage Foundation of Newfoundland and Labrador designated the Basilica of St. John the Baptist a Registered Heritage Structure.